Heat oven to 350°F. In large bowl, break up cookie dough. Stir or knead in cocoa until well blended. Press into ungreased 13x9-inch pan. Bake 10 to 12 minutes or just until set. Cool completely. Crumble baked cookie. Gently press half of the cookie crumbs into bottom of ungreased 8-inch springform pan. Spread softened vanilla ice cream over cookie mixture in pan. Evenly top with remaining crumbled cookies; press gently to make an even layer. Top with peanut butter ice cream. Cover pan with foil; freeze 8 hours. Remove side of pan. 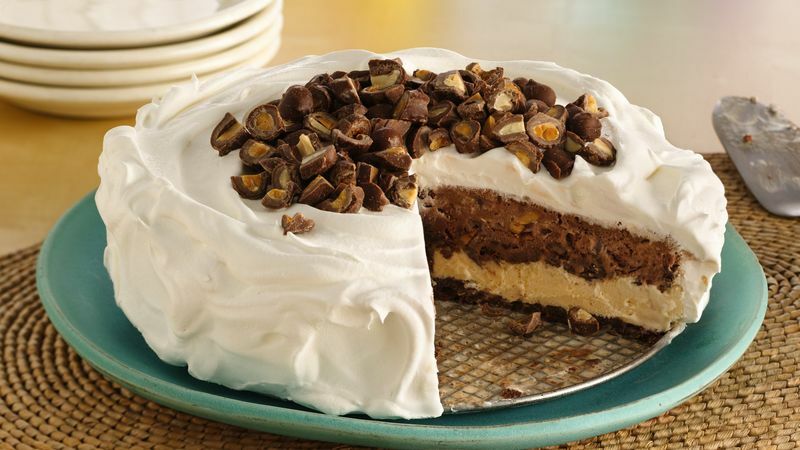 Place ice cream cake on serving plate. Frost top and side with whipped topping. Sprinkle with chocolate-covered peanuts. Store covered in freezer. For a birthday version of this cake, stir colored sprinkles into sugar cookie dough, and layer with your favorite ice cream. This cake can be made up to 2 days ahead. Garnish with chocolate covered peanuts just before serving.